Hydrosols are the water product from the distillation of flowers for extracting essential oils. 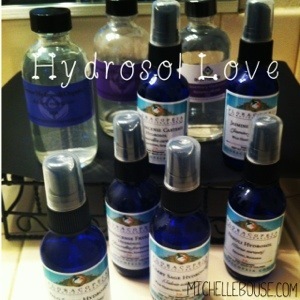 Hydrosols contain the same properties of the oil and are gentler for kids, elderly & animal use. You can spray Hydrosols directly on the skin, unlike essential oils that need to be mixed with a carrier oil before applying to the skin. They are wonderful for skincare and smell delish! I clean my face then spray a cotton pad with the Hydrosol and wipe all over my skin as a toner. My skin is so soft and clean. Then I mist my face & chest before I go to sleep. Let me know what YOU use your Hydrosols for.